Seattle Archives - Go Northwest! A location-based ongoing commentary about points of interest in the Pacific Northwest. Enjoyed a beautiful day in Seattle. 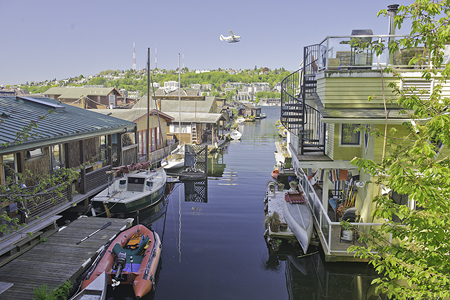 First stop was along the east shore of Lake Union to catch this shot looking west at houseboats, the lake and Queen Anne Hill in the background just as the float plane was taking off. Had found a small open space between ample shrubbery to get a good view. The spot is near the water’s edge on Fairview Avenue East between E. Newton Street and East Boston Street. GPS coodinates: N 47, 38.2427; W 122, 19.7696. This entry was posted in Attractions, Seattle, Washington and tagged Houseboats, Lake Union, Seattle, Seattle houseboats on May 3, 2013 by Jack High.